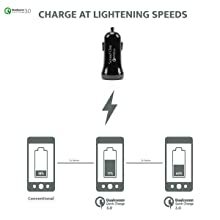 Sound One car charger delivers 2.4A per port. iPads require 2.4A charge. It can charge 2 iPads simultaneously making it one of the few chargers in the market to deliver 4.8A current speed (2.4A + 2.4A = 4.8A). 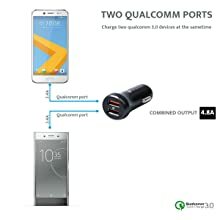 Qualcomm Quick Charge 3.0 Technology in both port reduces charging time by over 50% and allows for a powerful charge. 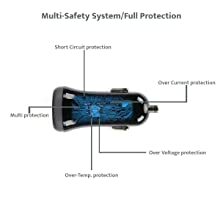 Charge safely as built in safety features protect the device from Temperature surge, Over-current, Over- Voltage and Short-circuit. 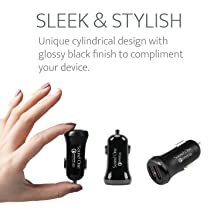 Potrable Travel Charger, attractive & Compact design is specially made to make traveling easy.You can charge your phone while your passenger charges their MP3 player. Quick Charge 3.0 compatible devices, you can get 27% faster charging speed than Quick Charge 2.0 Charger. For non-compatible devices, you can get same Charging Speed with Quick Charge 2.0 Charger. Backwards compatible with all versions of Qualcomm Quick Charge technology (1.0, 2.0 & 3.0). Also compatible with USB-C and can provide standard charging for non-Quick Charge devices. Supports Turbo Charging of Apple iPad, iPhone, and many USB Charging type devices.